In many ways Romain Jerome’s DNA Collection best personifies the early years of the brand and the sort of watches for which it gained prominence, with their names reflecting the samples of objects and things that found their way into the timepieces. We recently finally had the chance to handle the Moon Orbiter GMT. Historically, my Romain Jerome preferences have tended towards the collaboration pieces, but this rebooted Moon Orbiter, now called the Moon Orbiter GMT and with a newly rounded case and retrograde GMT, may be one of my favourite Romain Jerome watches to date. This considerably less angular (and thus probably more wearable for more people) new case is 48.5mm and made of steel that contains, of course, metal from the Apollo 11. The spring piston integrated lugs mounted on pneumatic cylinders and the ‘X’ motif on the dial are unchanged. The ‘moon’ part of the ‘Moon Orbiter’ is also present on the rotor, which is carved from blocks made from a patented alloy (Moon SilverRJ) made from low oxidation silver that contains moon dust. Functionally there are the hours and minutes at 3 o’clock, the 12-hour retrograde GMT at 12 o’clock, day/ night indicator at 2 o’clock, power reserve at 6 o’clock, and a rather modern looking flying tourbillon at 9 o’clock. So what is this all powered by? The Calibre RJ7813L, a completely new movement made in conjunction with La Joux-Perret and which as a power reserve of forty-five hours. The retrograde GMT is a fully integrated function. Moon dust or no moon dust, Apollo 11 or no Apollo 11, what draws me to this watch is its looks – the new case shape in conjunction with the dial – grey with laser engraved pattern that Romain Jerome are calling ‘stellar-patterned’ but which I would like to think of as ‘abstract moon craters’, the rhodium-plated and satin-brushed red lacquer hands. Yes the dial’s design is fundamentally the same as the original, but its overall ‘look’ seems quite different in a new case and with the longer slimmer hands. It is very contemporary look, the sharp lines and functional-industrial look that I find appealing not just in and of itself, but also because it seems fitting as a representation of the the functional design of spacecraft. 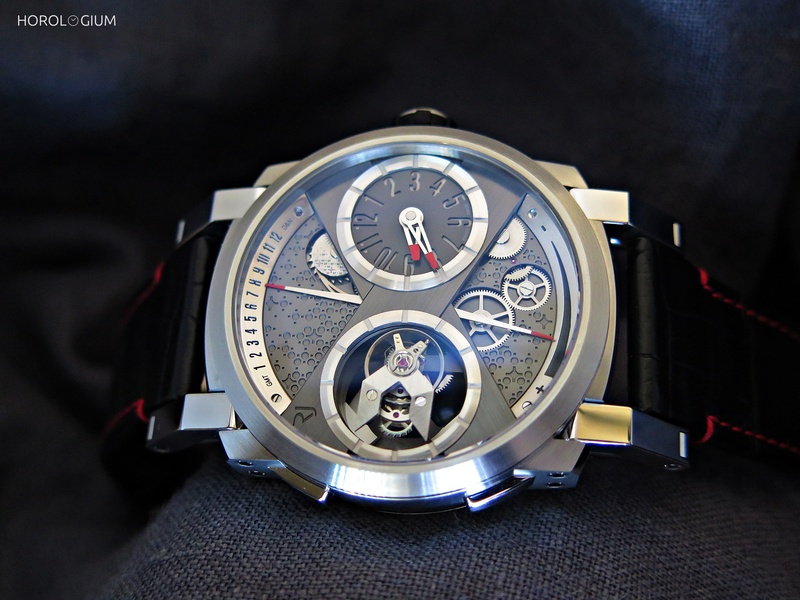 As was the case with the Moon Orbiter, the GMT version is a limited edition of twenty-five pieces.